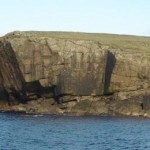 We’ve made the topo for Raasmi, Shetland’s first sport crag a free download. The topo can be printed on a sheet of A4. Raasmi is a great little crag for an evening session in summer and well worth a look if you’re looking for a quick session. We’re hoping to add a few more routes to the crag in the near future, to the left of Hilti’s Big Adventure. There are some really nice looking roofs and overhangs here that would be quite tricky but good fun. If you’re keen to see development, please consider donating to the site so we can afford the bolts!